The Castle, dating from 1593, forms an eight-pointed star, and stands on the fortified Garrison Hill commanding impressive views out to sea. 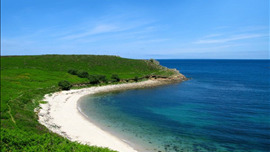 It was originally erected to defend the Scilly Isles, but these days it performs a more peaceful function by providing sustenance and hospitality for visitors to the island. It is still surrounded by a dry moat, and many of original features - including the old ramparts - remain untouched. The hotel has two restaurants: the Castle is a stone-walled dining room offering classic dishes, while the Conservatory provides a more breezy summertime setting for local seafood specialities.